I acquired my AHM Plymouth diesel as part of a Minitrains set way back in the 60s and never used it, so it is in mint condition. 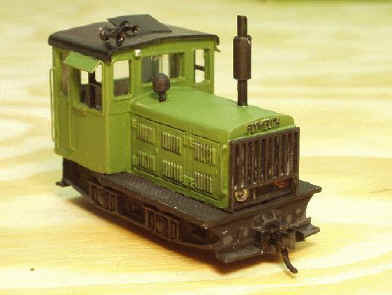 I really wanted to have a well-used "critter" loco, though, and took Al Sandrini's advice to buy a F&C Plymouth body. It fits the AHM chassis/mechanism perfectly. 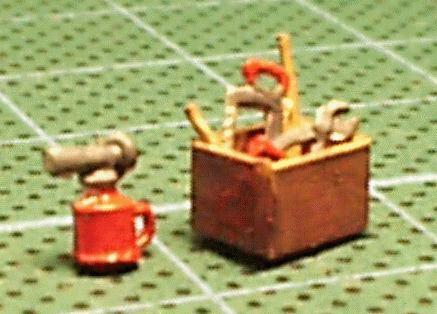 I also consulted with Peter Bartlett about how best to add MicroTrains couplers to it. The AHM body on the F&C chassis. Sun shades on the side windows and a roof hatch with open cover cut in the roof. 3/18/04 A coat of Monte Sano RR Green and now it is time for window glazing and the details, horn, air intake, and exhaust pipe - but I really have to let the paint dry first. 3/19/04 Windows glazed, horns, intake and exhaust added, and radiator guard installed - let's call it done! 3/22/04 Here is a box of tools to sit on the running board. I am doing a similar one for the Egger Bahn.